The new peace garden will provide a lasting tribute to those that gave their life for Britain 100 years ago. 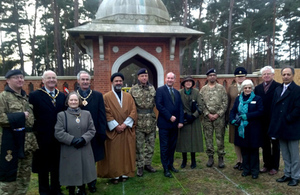 Today (11 December 2014) Communities Minister Stephen Williams launched the second stage of the transformation of a former First World War Muslim cemetery into a peace garden. The former cemetery at Horsell Common near Woking was originally built in 1917 as a final resting place for Muslim soldiers of the pre-partition Indian Army who had died at the temporary Indian Army Hospital in Brighton Pavilion. But the site fell into disrepair and the graves were later transferred to Brookwood Cemetery. There were 19 burials during the First World War and each was marked with a round arched headstone facing west, in accordance with Islamic tradition. A further 8 burials were interned following the Second World War. The peace garden will contain 27 Himalayan birch trees planted to symbolise the men who were once buried there. Pink and white heather will also be planted in strips, pointing towards Mecca. The new peace garden has been conceived to mark the centenary of the First World War and will provide a lasting tribute to those that gave their life for Britain 100 years ago. Around 1.3 million pre-partition Indians – people from modern day Pakistan, India and Bangladesh – fought for Britain during the First World War. Approximately 400,000 were Muslims. The Woking Peace Garden project has been funded by grants from the Department for Communities and Local Government, English Heritage and the volunteer group Horsell Common Preservation Society and Surrey County Council. "Peace gardens bring communities together to plan, work and care for a common space which can be enjoyed by all. "The Woking Peace Garden will allow this community to reflect on the sacrifice of so many during the First World War and to remember the brave men who came from across the world to fight for our freedom. "Over the next 4 years we will continue to mark the contribution of all those that fought for Britain 100 years ago and I hope this garden will allow everyone in the local community to come together and learn about our shared history together." 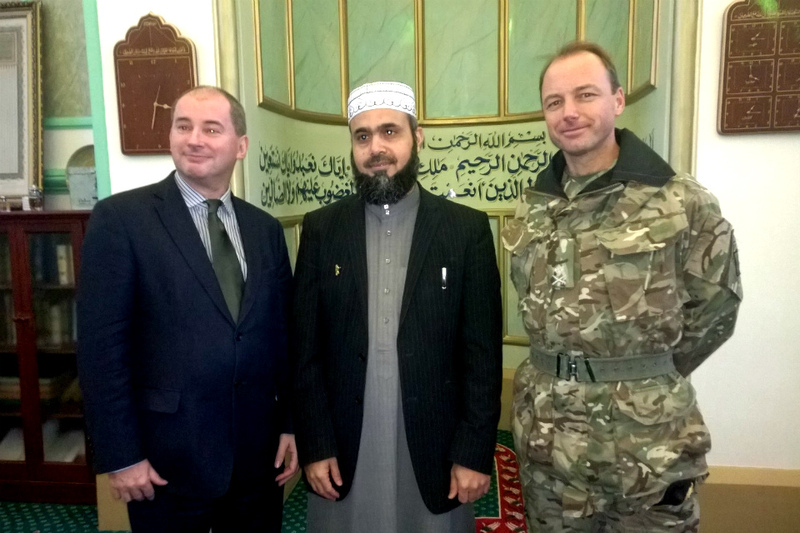 After launching the restoration programme at the Woking Peace Garden, Stephen Williams visited the nearby Shah Jahan Mosque, the oldest mosque in the UK. Later the minister also paid his respects at the graves of the Muslim soldiers which had been moved to the military section at Brookwood Cemetery. The Department for Communities and Local Government has provided £50,000 funding to Woking borough council to help create the Woking Peace Garden – a lasting memorial to Commonwealth servicemen who fought during the First World War. The Shah Jahan Mosque, built in 1889, was the first mosque to be built in the United Kingdom. It was built by Dr Gottleib Wilhelm Leitner and was commissioned by the ruler of the state of Bhopal in India, Shah Jahan. Ever since then, it has been maintained as a religious endowment (Waqf). Since its inception the Shah Jahan Mosque has been a focal point for local people and continues to this day to play a pivotal part in the life of the local Muslim community. Brookwood Cemetery is the largest cemetery in Western Europe. Since its opening in 1854, approximately 250,000 people have been laid to rest within its grounds. Within the cemetery is the Brookwood Memorial, a memorial which commemorates 3,500 men and women of the forces of the British Commonwealth who have no known grave. For more information on how the government is building a fitting commemoration of this significant milestone in world history, please seeFirst World War Centenary.